BLTs are one of my favorite comfort foods of all time. What makes them so different from other comfort foods is that they can be whipped up in no time. This, I love. This is my fun spin on a traditional BLT. I am OBSESSED with burrata lately. When it comes to cheese, it’s all I can think about; and now that we have a Trader Joes (FINALLY!) in the area, I’ve been able to stock up on burrata for a fraction of the price at other large grocers. For those of you who may have never heard of it, Burrata is basically a fresh mozzarella cheese stuffed with a mixture of mozzarella and cream. When you cut into it, the mozzarella and cream mixture just oozes it out. It’s fabulous…just fabulously delicious. It’s also addicting. Beware. This recipe is a simple lunchtime snack, that can be prepared ahead of time if you’re on-the-go. Bacon and burrata…you can’t go wrong with that combination! Mmmmm…Baconnn. Description: I usually don’t gravitate towards pilsners, unless it’s Oskar Blues’ Mama’s Little Yella Pils, and then I am completely ok with it. Pilsners have to have some substance to them for me to fall in love with one, and Yella Pils has a lot more than substance. I don’t want to toot my own horn or anything, but one thing I do know a little bit about is pairing beer and cheese. Burrata cheese is my new obsession, and burrata cheese pairs so well with pilsners, that I can’t even begin to get over it. You get sweetness, along with a little bit of bitterness, in this Czech-style pilsner which is the perfect pairing for many cheeses, especially Burrata. It’s also very light and refreshing. It’s subtle enough that it won’t take away from the deliciousness that is the cheese, but will enhance it’s flavor. This brew is a solid drinking beer, so pick up a 6-pack next time you’re at the liquor store! Burrata puts a fun twist on just about anything you make! Put it on a BLT next time and top it with a spicy mayo! Preheat your oven to 375 degrees F. Line a lipped baking sheet with foil, and place a wire rack on top. Lay out your bacon slices on top of the wire rack. Bake the bacon until crispy, about 10-15 minutes. Remove bacon from oven, and transfer it to a paper towel-lined plate to get rid of any excess grease. While your bacon is cooking, prepare your mayo. In a medium bowl, whisk together the mayo, chili powder, salt, garlic powder and lemon juice. Set aside. Spread a layer of spicy mayo on two of the four slices of toasted bread. Spread the burrata, carefully, on the remaining two slices of bread. 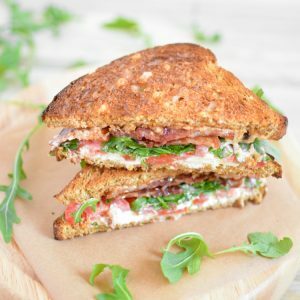 Top the cheese slice with bacon, tomato and wild arugula. Place the mayo slice on top of the arugula. Cut in half and serve immediately. Enjoy! Hardware: * Measuring Cups * Measuring Spoons * Lipped Baking Sheet * Foil * Wire Rack * Medium Bowl * Whisk * Knife * Paper Towel-Lined Plate * Makes two sandwiches. This BLT is calling my name! Haha. It was gone in minutes, Jocelyn! Thanks, Kim! … and welcome! Pingback: Stumbling Over Chaos :: Holy crap, linkit got totally out of hand when I wasn’t paying attention! I’m so happy you enjoyed it, Courtney! Thanks for trying the recipe!